The opening of the Mufford/64th Avenue Overpass marks the completion of all nine Roberts Bank Rail Corridor projects in the lower mainland of British Columbia. Happy dance! Like others completed as a part of this project, this overpass will improve safety by eliminating the need for road traffic to wait at a rail crossing. We also completed other enhancements in the area including the realignment of the Mufford Crescent/Glover Road intersection. We captured the construction of this overpass on video and condensed it down into a cool little time-lapse video. 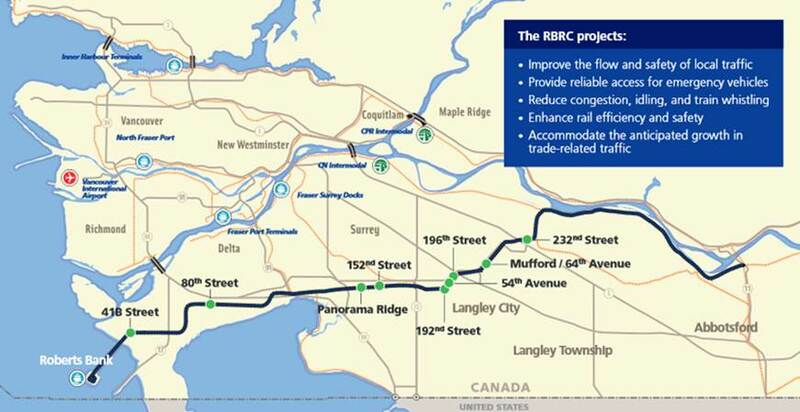 What is the Roberts Bank Rail Corridor project? Basically, it’s a 70 kilometre stretch of road and rail infrastructure connecting Canada’s largest container facility (Roberts Bank) with the North American rail network. It carries increasing volumes of freight through the communities of Delta, Surrey and Langley, which is why these nine projects are so important. They will help decrease the impact that freight volume has on local traffic while giving those important freight loads a fast track to markets across the country. It’s a part of our bigger plan – the Pacific Gateway. Do you have any questions about the Roberts Bank Rail Corridor Project or the Pacific Gateway that we didn’t answer here? Let us know in the comments below or connect with us on Twitter or Facebook. We look forward to hearing from you. A press release from Transport Canada last fall indicated that the RBRC project had been completed including $10 million in at-grade crossing improvements as part of the Whistle Cessation Project. Despite the completion of the projects, trains on the corridor continue to blow their horns at crossings through North Delta and Surrey. I contacted the City for Surrey and they indicate that actions are required by other levels of government before the train whistles (horn) are no longer used in this area. Thanks for connecting with us here. We will follow up with the program manager and let you know where the program is at currently. Whistle cessation is a detailed process which, if appropriate, will take time to complete. It requires railway, municipal and road authority cooperation, notification to named parties, review by a qualified individual and incident indemnification. All other crossings still require the sounding of the whistle, including SRY operations crossing Surrey into Langley. To the north there are Worrell Crescent (1.3km), Crush Crescent (1.7km), 216th St (2.5km), Glover Rd (3.4km) and one other (Smith Crescent (2.1km)) and, to the south, Langley Bypass (0.5km) and 200th St (2.0km). Trains exceeding 44 MPH must sound whistle signal 1/4 mile before the crossing, to be prolonged or repeated, until the crossing is fully occupied. Note: A whistle post will be located 1/4 mile before each public crossing where required. Trains operating at 44 MPH or less must sound whistle signal to provide 20 seconds warning before entering the crossing and continuing to sound whistle signal until crossing is fully occupied.